CTAC has extensive expertise and experience in supporting project implementation and conducting multi-year evaluations. CTAC’s capabilities comprise all facets of program evaluation and program performance review and reporting. CTAC is working with Harmony Public Schools, a charter system with schools in across Texas as evaluator of a 5-year TIF grant for performance-based compensation. 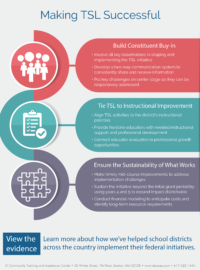 The program is designed to improve teacher performance through a new professional development structure for teachers and principals that includes clearer pathways to leadership and incentives for improved student growth. 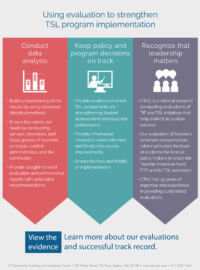 CTAC is gathering student achievement data as well as surveys and interviews to assess the impact of these changes on student performance and school climate. Learn more about performance-based compensation and the key components for successful implementation.